Sometimes workbooks just seem to grow in size. You might start with just one tab, but then it’s not long before you have 10. In the worst cases, they can grow even further – 60, 70, 80. From Excel 2007 and above there is no limit to the number of worksheets, it just depends on when your computer runs out of memory (with today’s computing power that’s a big number). When dealing with big workbooks you’re not the only one who finds scrolling between the worksheets annoying. Some days I can waste huge amounts of time just scrolling backwards and forwards, over and over again, just trying to find the right worksheet. The truth is, we’re not paid to scroll between worksheets, this is pure wasted time that we could put to better use. I decided that enough was enough. So, I introduce to you, the Tab Hopper Add-in. Tab Hopper does one thing, and one thing only. But the one thing it does, it does really, really well. Tab Hopper helps you to quickly and easily navigate around workbooks. You get to save time and achieve more. What does Tab Hopper do? 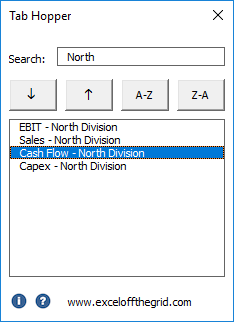 Once installed, Tab Hopper can be found on the Excel Off the Grid (EOTG) ribbon. This ribbon contains two buttons Hop and Tab List. Have you ever had to move between two worksheets, which aren’t next to each other? Constantly scrolling back and forth, it just seems so frustrating. Clicking the Hop button will move back and forth between the current worksheet and the previous worksheet. No more scrolling required. Tab list will display a list of all the worksheets in the current workbook (including Hidden and Invisible) worksheets. Just click on the sheet you wish to see and you will go straight to it. Search for any characters within the worksheet name. Sort the worksheets in normal, reverse, A-Z and Z-A order. Even with the Tab List open you can continue to work on your spreadsheet; you do not need to close the Tab List window. Which means, all the worksheets are just one click away. 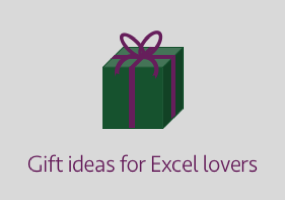 I want to thank Jan Karel Pieterse for letting me use his code for keeping the UserForm on top of the Excel windows, without this the Add-in would not have been as good in Excel 2013 and above. The best thing about Tab Hopper – it’s FREE! The best thing about Tab Hopper is . . . it’s completely Free! You can have Tab Hopper installed and ready to go in just a few seconds. Subscribe to the newsletter and you will receive an e-mail with the add-in. It’s that simple. If you don’t like the newsletter you can always unsubscribe, you’re free to keep using the Tab Hopper Add-in for as long as you wish. 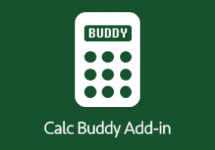 Which versions of Excel does Tab Hopper work on? Tab Hopper works on Excel 2007-2016 for Windows (sorry Mac users). How many devices can I install Tab Hopper onto? Each license is on a per-user basis for an unlimited number of devices, so you can use Tab Hopper at home and at work. Can I share Tab Hopper with my friends and work colleagues? Just send them a link to this page and they can sign-up to get their own copy of the Tab Hopper add-in. 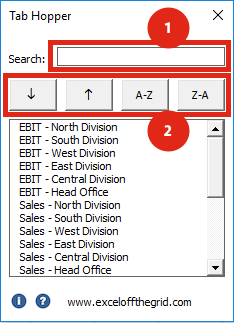 There help pages can be accessed from within the Tab List form of the Tab Hopper Add-in. The help page can also be found here.